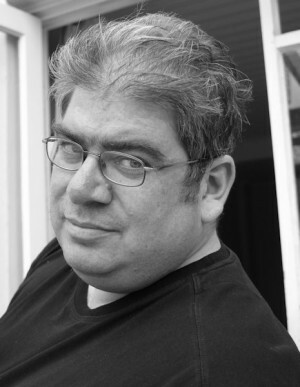 Ben Aaronovitch was born in 1964. He had parents, some brothers, some sisters and a dog named after a Russian cosmonaut. He also had the kind of dull childhood that drives a person to drink, radical politics or science fiction. Discovering in his early twenties that he had precisely one talent, he took up screenwriting at which he was an overnight success. He wrote for Doctor Who, Casualty and the world’s cheapest ever SF soap opera Jupiter Moon. He then wrote for Virgin’s New Adventures until they pulped all his books. Then Ben entered a dark time illuminated only by an episode of Dark Knight, a book for Big Finish and the highly acclaimed but not-very-well-paying Blake’s 7 Audio dramas. Trapped in a cycle of disappointment and despair Ben was eventually forced to support his expensive book habit by working for Waterstones as a bookseller. Ironically it was while shelving the works of others that Ben finally saw the light. He would write his own books, he would let prose into his heart and rejoice in the word. Henceforth, subsisting on nothing more than instant coffee and Japanese takeaway, Ben embarked on the epic personal journey that was to lead to Rivers of London (or Midnight Riot as it is known in the Americas). At some point during the above, the most important thing in his life happened and he became a father to a son, Karifa, whom he affectionately refers to as ‘The Evil Monster Boy’. The Evil Monster Boy will be reaching university age soon, so all donations will be gratefully received. Ben Aaronovitch currently resides in London and says that he will leave when they pry his city from his cold dead fingers. Ben Aaronovitch has stormed the bestseller list with his superb London crime series. A unique blend of police procedural, loving detail about the greatest character of all, London, and a dash of the supernatural. In the new novel DC Peter Grant must head south of the river to the alien environs of Elephant and Castle. There’s a murderer abroad and, as always when Grant’s department are reluctantly called in by CID there is more than a whiff of the supernatural in the darkness. 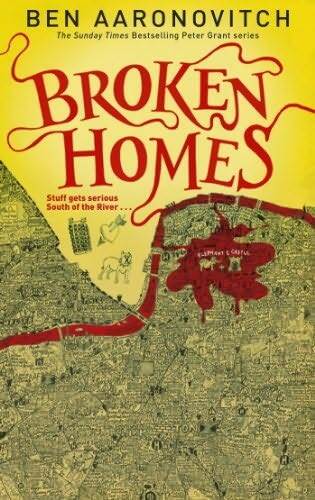 When Rivers of London came out in 2011 it was in my opinion ground breaking, each book in the series has built upon the last in a unique, witty and captivating style (Broken Homes, takes it to a new height). Peter Grant the main protagonist could be a guy you went to school with, well if you forget the fact that he can do magic, and is often as confused about it as you or I. Nightingale (his boss) is the mentor, some would say the Dumbledore, I would say the Doctor Who, the man with the past he doesn’t share, the knowledge he drip feeds, and the personality of the irritable professor. What I love about the series is the total unpredictable nature of the story/ Series, the topsy turvy contrary nature of the River spirits/ Gods and other magical beings. The twists and turns and machinations of the faceless man leave you guessing constantly as to where things will go next, what risks Peter will take next and powers he will try and use. Broken Homes introduces a new form of magic and takes us further into the political/ magical landscape of London and the Rivers. It throws up some serious surprises for the established characters, and delves deeper into the past, with more hints at the geo-political/ Magical landscape of Europe during WW2 and before. In this series there are always some fantastic side plots, the boy meets girl plot lines, the boy runs from crazy girl, or girl from boy who does magic. Always the story arc and the small incidentals will leave you smiling or laughing out loud. This truly is the most interesting, uniquely funny series being written. Its a must read, no matter what genre you like.